Taro root has good source of Dietary Fiber, Vitamin E (Alpha Tocopherol), Vitamin B6 and Manganese. 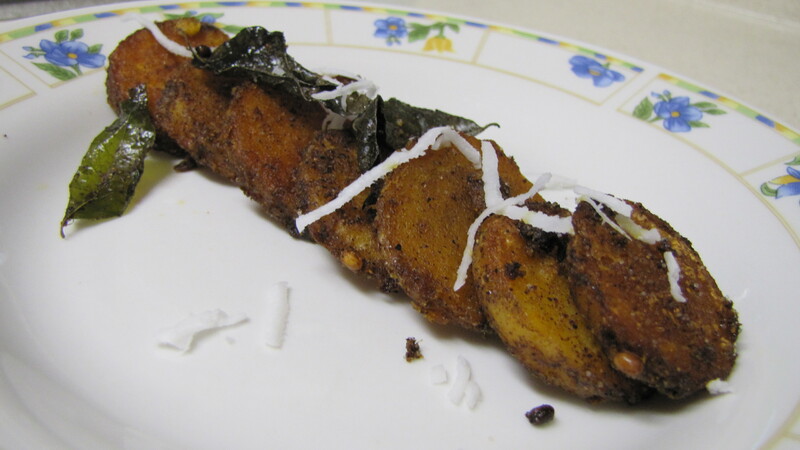 For those who tries to reduce their fat intake, i think they should go for taro root..
Whatever may b reason who can say no to the crispy fried delicious heartier and healthier item..
u know what remembers me when i think abt this taro fry.. Thatz my Broooo, who is a die hard fan for this veggie.. He doesn't need anyother thing not even rice apart from this . He would eat this all day..
Well, coming back to the recipe, it requires minimum work. First we have to boil the roots .Make sure, u don't make it mushy.. Better to keep it in the pressure cooker for exactly 5 minutes (for 6 mdeium roots, adjust the time accordingly if u add more or less). Immediately take out the roots from the cooker and place it on a plate and allow it to cool.Once cooled ,peel it and make it into medium thick slices. Now take a wide pan and put 1 tbsp of oil and do the tempering with curry leaves and urad dal as this nice flavour to the dish. Keep the flame in low.Add the GG paste, all powders,salt and give it a stir for 1 minute so that the gg paste cooks and blend with the masala's added. Dump in the sliced roots and slowly coat on all the sides of the roots. Increase the flame to medium. Leave the pan undisturbed for 2 minutes. Later flip the slices to the other side and rest for again 2 minutes. Do the same procedure until u get a nice roasted texture on both sides of the roots. switch off and serve.